I'm not the most materialistic girl, but I do like fashion and I do like a good deal. It's an internal conflict based entirely on budget. Actually, it's rare that I buy designer purses unless it's majorly on sale or given to me as a gift. This coupon has me tempted, however. The Coach Factory store has been extending their additional 20% off coupon for weeks, and now has a slight revision. Take 20% off purchases of $250 or less and 30% off purchases of $300 or more. The coupon is only valid at Coach Factory stores through Sunday, May 9, where you can expect the items to be discounted already. Happy spending! One of the many wonderful things about spring is how easy it is to transition into summer. The spring merchandise sales happen right when you need them the most: when the sun comes out. Bloomingdale's is having a Spring Shoe Sale through Sunday, May 9 with 25 to 30% off select merchandise. Then, buy 2 or more pairs and receive an additional 20% off. The discount works online with code SHOESALE and in stores with the coupon. Why give away one lightbulb when you can give away two? The answer was simple for Energy Efficient NOW. Shipping is so expensive for one, you might as well send two while you're at it! According to energyefficientnow.com, CFL lightbulbs use 25% of the electricity of traditional incandescent lightbulbs, saving $30 per bulb on your monthly bill, among other pluses. If you get in a conversation about clearance sales, chances are Macy's will come up. They're known for marking their merchandise down, then marking it down over, and over again. Now you can save even more at the Macy's Friends & Family Sale with an extra 25% off through Monday, May 3. And yes, the coupon can be used on sale merchandise. The savings pass is valid in stores and at Macys.com with code MACYSFF. Some items only receive 10% off, including: personal care, floor care, electronics, furniture, mattresses and rugs. What does it not include? Coach (online), TAG Heuer (online), cosmetics, fragrances, toys, baby gear, kids’ shoes, and Tempur-Pedic mattresses. Comic book lovers unite! Saturday, May 1 is Free Comic Book Day, with participating locations giving away free comic books to all customers, all day long. So bring your patience, a group of friends, and tell any kids you know. Kids of all ages can enjoy this freebie. To find a store near you, use the "FCBD Store Locator" at the top left corner of freecomicbookday.com. There's also a lot of useful information there. Not long ago, I told you about this awesome e-commerce site, BeautyTicket.com. Described as the "VIP Pass to Beautiful Deals," it is definitely the place for premium discontinued or overstocked cosmetics with major discounts. Ever wonder what happens to seasonal cosmetics after the season ends, or where products go when packaging is redesigned? This is where. With product that's constantly changing and prices that can't be beat, there's always something to be found at BeautyTicket.com. Speaking of, you can save 20% off a selection of merchandise in their Mother's Day Boutique right now, with code MOTHER15. Now, who wants a $100 gift card? I've got one to give away to a lucky reader! What would you get from BeautyTicket.com? 1. Answer the question on Miss Bargainista's Facebook wall. You must "like" the Miss Bargainista and BeautyTicket.com pages for your entry to be valid. Each method gives you one entry. Tweet as many times as you like to be entered multiple times. Feel free to edit your tweet to fit. The giveaway lasts through Wednesday, May 12 (11:59am PST). Good luck! UPDATE: This giveaway has ended. Winners will be announced on Monday, May 17. If your name is listed above, you won a $100 gift card to BeautyTicket.com! E-mail me by clicking the "Contact" button above and tell me your address and e-mail address. Thanks for your participation and enjoy your prize! I scream, you scream, we all scream for ice cream! It's not free, but it might as well be. Wednesday, April 28 is 31 Cent Scoop Night at Baskin Robbins, with 31 cent scoops between the hours of 5pm and 10pm. What you get is obvious—a scoop of ice cream for only 31 cents, with a limit of 3 per person. Surely, you can find 31 cents floating in one of your pockets or buried in your purse. The promotion benefits The National Fallen Firefighters Foundation, and is available in the U.S. and Canada. To find a location near you, use the Baskin Robbins store locator. Do you watch the runway and wish just one thing would magically appear in your closet? Go get your credit card. Diane von Furstenberg is having a spring cleaning sale with up to 70% off select items online. Choose from a variety of styles, many from the 2009 Fall and 2010 Resort runway shows. Like this Short Didi Coat in black—it was look #10 at the Fall 2009 runway show and originally priced at $495. The coat is now $148.50. The good thing about DVF is the designs are timeless, so it won't really matter what season your purchase is from. If you're a resident of the Bay Area or Long Beach, on a budget and need a getaway, today's the day to book your flight. Jet Blue is offering $9 flights each way between Long Beach and San Francisco or Oakland. The catch? Flights need to take place on April 27 and 28, May 4 and 5, May 11 and 12, or May 18 and 19, so your trip needs to last either 1 week or 1 day. Of course you can fly on another day for a higher rate and combine it with one of the $9 days, if you must. The discount automatically shows up when you search online. I did a search and the total came to $39.40, including taxes & fees. Not bad. Plus the first checked bag is free. The flight needs to be booked by 11:59pm Eastern Time, so book your flight now! I could have sworn National Pretzel Day was just yesterday, but here it is again. This year's prize remains the same, a free pretzel at Pretzelmaker or Pretzel Time. But this time you'll have to work for it. 1. Sing a part of any song you like at participating Pretzelmaker or Pretzel Time locations on Monday, April 26. 2. Say "Happy National Pretzel Day" instead. But what fun is that? The offer is valid all day long, depending on the hours of the participating location near you. Visit pretzelmaker.com for more details. Want another free pretzel? Join the Pretzelmaker and Pretzel Time fan club for a coupon, plus other offers and a gift on your birthday. It's a big day at Target. The Zac Posen for Target collection hit shelves today, and as expected, items are flying off the racks. As with most of the Go International collections, there are some big hits and misses, and you'll be lucky to find any size between 1 and 13. Posen's tops did nothing for me, but there were a couple of skirts that are to die for. I scored this black Ruche Skirt for $34.99, which was completely unidentifiable on the hanger, but an instant hit when worn. In fact I couldn't quite tell what it was on the rack, but it was in my size, so I went for it. Thank goodness I did. I love it! 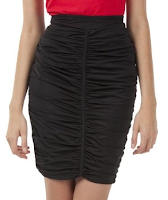 Another skirt I may purchase online, since I couldn't find it in stores, is the black pleated Tuxedo Skirt for $39.99. The detailing is gorgeous, and it's a thicker fabric that'll be perfect for fall. The Tuxedo Pants ($39.99) were also a hit in my book, with a slim fit and tuxedo stripe down the side, plus blue piping detailing on the pockets. One item I'm dying to see in person is the Two-Piece Ruffle Dress for $79.99. It's a convertible strapless black dress, which can be worn with or without the ruffles. I'd love to see it layered over a fitted navy top, and appreciate the fact that it's two dresses in one. Are you noticing a black theme here? I have got to find a way to add some color to my wardrobe! At this point, it may be best to shop online and return items to your local store if they don't work out. You can also search by zipcode to find out if the item is available in a local store, but you will want to call ahead and confirm. If you do shop in stores, make sure to hit up the clearance rack, where you'll find Liberty of London and Jean Paul Gaultier merchandise marked down by 30 to 50%. Thanks to NessaLee Style for the heads up via Twitter! UPDATE: I found the Tuxedo Skirt! It was at a store that told me they didn't have it when I called. But I showed up and there it was. Woo hoo! I am now the proud owner of two Zac Posen for Target skirts. Need some relief? The Aveda Stimulus Coupon is back with a free sample of Aveda Hand Relief. And that's not it. Take the coupon into an Aveda store and receive a cup of comforting tea, stress-relieving hand ritual, 5 minute neck and shoulder massage, aroma sensory journey, and a makeup finishing touch, all for free with your sample of Hand Relief. No purchase is necessary when used in stores. To find a participating location near you, use the Aveda Locator. Or use, it online at aveda.com with any purchase of $50 more, using code STIMULUS. If you missed Earth Day and it's deals, you're in luck. Many of the festivities have been extended through the weekend. Here's a sale I just found, which I'll be heading out for any minute. It's the $1 sale at Buffalo Exchange. Buffalo Exchange is a hip store where you can buy new and recycled clothing, or trade/sell your own. The $1 sale is a benefit to help save wildlife from trash, with proceeds benefiting The Humane Society of the United States. The event also features cats and dogs in store for adoption. It's good for the planet AND good for your wallet, so what are you waiting for? View the map of stores to find a Buffalo Exchange location near you. UPDATE: I just got back from the sale, what a scene! I visited the Berkeley location where they were selling all $1 items on the sidewalk. I bought 17 items total! Employees are replenishing the racks every half hour or so, and the customers are vultures. You will be too by the time you leave. 1. Be prepared to wait. A lot. But also be ready to jump to the racks as soon as their replenished. 2. Watch the person restocking the racks. Clear a nice empty spot on the rack next to you. Chances are they'll put a pile there. You can also try following them, but you'll have to battle whomever is waiting at the rack. If you insist on following, do it after they've dropped the first or second load. The other customers swarm for those, and you'll get first dibs on the others. 3. Don't hesitate. Just grab! You can always put items back that you don't like. 4. Invite your friends and hoard. There was a group of girls strategically scattered to grab items, then share with each other. They were all the same size, and they drove me crazy because they got all the great items. But their method did work. 5. Hang out near the hoarders. If you see anyone with good taste hoarding a bunch of clothes in your size, stand near them. They won't buy it all and they will put unwanted items back on the rack. One person's garbage is another person's treasure. 6. Bring cash! A check works too, which can be made out to The Humane Society for the United States (HSUS). That saved me because I only had $7 in my wallet. However, cash would've been much easier and quicker, considering the chaotic scene. Credit is not an option. 7. Make a day of it. Find other things to do in the area, then revisit The Buffalo Exchange throughout the day. Since they're bringing out items gradually, you'll find something new every time you stop by. 1. Save $10 off your purchase of $10 or more at Aéropostale, valid April 24 and 25 with coupon. You could easily walk away with a purchase that's close to free. The coupon is only available in stores. 2. While there, try to score a free tee. Bring the May 2010 issue of Seventeen with you or a printout of the Seventeen.com homepage. You'll have better luck with the actual issue, sometimes the rules of these giveaways conflict with what the stores actually do. The giveaway started on April 6 and will end when all 30,000 tees are given away. Oh, and you have to be (or appear to be) between the ages of 13 and 29. Read a scan of the coupon for more information. Use the Store Locator to find an Aéropostale near you. You may want to call ahead to confirm that they still have more tees, and if the printout of the Seventeen.com homepage is sufficient. Best of luck! Saks Fifth Avenue: Extra 20% off online and in stores with coupon. Save 20% at saks.com with code FRIEND3. Cosmetics and fragrances are 10% off, and some exclusions apply. The coupon also works at the outlet store Saks Fifth Avenue Off 5th. 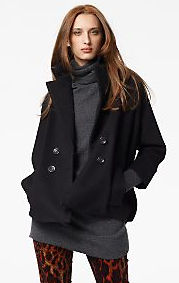 Ann Taylor: Extra 30% off at Ann Taylor stores, LOFT stores, anntaylor.com and LOFTonline.com. Receive 15% off at Ann Taylor Factory and Loft Outlet stores. Use code FRIENDS online, or print the coupon for use in stores. Tommy Hilfiger: Extra 30% off with coupon at participating locations only. Unfortunately, the online offer expired on April 21. Loehmann's: It's not called a Friends & Family sale, but it might as well be. Save an additional 25% off any clearance item with coupon, through April 25. Spring has sprung and the Friends & Family sales are popping up everywhere like little blossoms! Here's the latest: For two days only, take 30% off anything at Kate Spade. The Friends & Family sale takes place Friday and Saturday, April 23 and 24 online and in stores. I'm digging this over the shoulder, Roland Park Kirk purse. Yes, I like my bags small, how else would I ever find my keys? Plus, small bags are perfect for a night out on the town. Originally $255, it was marked down to $127 in the sale section, then to $88 thanks to the additional 30% off. The icing on the cake? All Friends & Family purchases include free shipping. To receive the discount online at www.katespade.com, use code FRIENDLY30 at checkout until 11:59pm PST on April 24. Or, print the coupon to receive the discount at Kate Spade retail shops and outlet stores. The discount is valid on regular and sale merchandise. Search the list of shop locations to find a store near you. Earth Day should be every day. It's true. But we still need a reminder from time to time. Ironically, Earth Day is also a good excuse for a giveaway or sale. Hey, at least they encourage some type of action, like recycling or planting. Here's a list of promotions available on Thursday, April 22, in celebration of Earth Day. I'll keep it updated with more deals as I find them. 1. Free full-size cleanser at the Origins Skincare Trade-In — Bring in the skincare you currently use and trade it in for a full-size Origins face wash or antioxidant cleanser. Bring all your empty cosmetics for recycling while you're at it. Origins is one of the few companies to have a recycling program, Return to Origins, for items that are not often recycled, like cosmetic bottles and caps. 2. Free hat at The Disney Store — Bring 6 empty soda cans or plastic bottles to the Disney Store. Toss the bottles into the "globe bin" and you'll get a free Friends for Change and Disney Store youth sized baseball cap. It's not the best looking hat, but yes, it is free. The event takes place from 11am to 3pm. 3. Free admission to National Parks, thanks to National Park Week — All 392 parks are participating, and free admission is available for one week, April 17-35. Some parks are even offering additional deals, like hotel and dining discounts. 4. Free mystery gift (most likely a plant) at Pottery Barn Kids - The announcement says kids will receive a "surprise they can plant at home." There will also be stories and activities for the little ones from 11am to 3pm. Be there closer to 11 to be sure you'll get your free seedling, ahem, mystery gift. 5. Extra 20% off The Body Shop online. Some locations, like Stoneridge Shopping Center in Pleasanton are offering 20% off through April 22 if you don't ask for a bag with your purchase. Call your local Body Shop to see if they're participating, otherwise buy online. 6. Receive 20% off your next kids purchase at H&M when you donate used clothes for kids, April 22-28. Donations benefit the Boys & Girls Club. I rarely shop at Walmart, mostly because the store gives me a giant headache. But I can't stop visiting Walmart.com. It's the free samples. I can't get enough of them. Walmart.com regularly offers a range of free samples and rotates them frequently. The samples are usually a new product in the store they want you to try. The little packages of joy arrive within 4 weeks, which I can confirm because I've ordered many of them. Eucerin Daily Skin Balance Body Lotion Choose between Eucerin Skin-Fortifying Body Lotion OR Everyday Protection Body Lotion SPF 15 and Everyday Protection Face Lotion SPF 30. I always go for the SPF. Earth Day is just around the corner, as are the Earth Day freebies and deals. Origins may have the most appealing, not-to-miss offer this Thursday. Bring in your current skincare to any Origins counter on April 22 to trade in for a full-size gentle, high performance cleanser from Origins. Choose between Checks and Balances frothy face wash or A Perfect World antioxidant cleanser with white tea. The offer has a value of $18.50 to $20, depending on which cleanser you choose. My recommendation is to bring your cheapest skin cleanser, or even buy one to trade in if you have to. And don't be shy to bring in a nearly empty bottle. For more information, visit Origins Facebook page. To find a retail store or counter at a department store near you, use the Origins Store Locator. Surely, you've had enough coupon-clipping and shopping lately. Yeeeaaah right. Still, we all need a breather every once in a while, so why not step out into the great outdoors? The National Park Service presents National Park Week, with free admission to any of the 392 national parks for one entire week. Starting on Saturday, April 17 through Sunday, April 25, receive free admission to any and all of the national parks of your choice. Some of the parks are even offering additional specials, such as discounts on hotel stays and merchandise. To find a national park near you, visit www.nps.gov/npweek. Make-up junkies! There are two sales ending on Sunday that you won't want to miss. 1. Sephora is offering Beauty Insiders a coupon for 15% off, valid April 12-17. The printable coupon can be used in stores or online with code MADNESS. Take on less guilt be browsing Sephora's sale section. That's where I found this Sephora Collection Age Prevention Moisturizer SPF 15 for only $10. Not a Beauty Insider? Sign up at the store to spoil yourself with this and future offers. 2. Urban Decay is offering an additional 30% off during their Friends and Family sale. The offer is valid only at UrbanDecay.com, where shipping is free when you spend $50. That shouldn't be too difficult. Just use code 1SFNF at checkout. Of course, I went straight to their "R.I.P. Items" section, where I found this discontinued lip pencil in Roach (pictured), marked down from $14 to $9. With a name like Roach, no wonder! It's actually a nice, dark reddish brown color. It's the coupon that keeps going and going and going. Save an extra 20% off at Coach Factory Stores through Sunday, April 25. Yes, the same coupon originally expired on April 11, then April 18, and now April 25. One reader said they were even handing coupons out at the entrance of the store. Use the Coach Factory Store Locator to find a store near you. There are two thoughts that come to my head now that it's Jamba Juice's 20th birthday. "Am I that old?" and "I am suddenly very thirsty." To celebrate, Jamba Juice has released a coupon to buy any drink off the Jamba menu and get one free. The coupon is valid April 14-25, giving you plenty of time to get organized with a friend. As if that's not enough, Jamba Juice introduces Feel Good specials April 25-May 31, with a special deal each day. Ideal Meal Monday will offer Ideal Meals for just $3. Buy Two Tuesday will feature a special pairing offer of the week. Wake Up Wednesday will offer steel cut oatmeal for only $2. Then on Tasty Thursday all baked goods will be $1 off with the purchase of any drink. Finally, on All Fruit Friday you can buy any 16 oz. All Fruit Smoothie for just $3. To find a location near you, use the Jamba Locator. Happy Birthday Jamba! We've heard of BYOB. Now there's BYOM. Bring your own mug to Starbucks on Thursday, April 15 to receive a free cup of coffee. The baristas will give you up to 20 fl. oz. of coffee absolutely free. It's all part of Starbucks' The Big Picture, a Green Project encouraging customers to make the pledge to use less paper cups. The event is happening at Starbucks locations worldwide. To find a Starbucks near you, use the Store Locator. Keep the tradition going after April 15, and receive 10 cents off for bringing in your mug on any given day. Free coffee to help save the environment? Count me in! If you need an update in a flash, there's always the good old-fashioned blow-out. Who doesn't feel like a million bucks after having their hair professionally styled and blown dry? Now you can save a buck at the Frederic Fekkai National Style Swap at Ulta stores, with a complimentary blow-out on April 14 or 15. I'm not sure what a Style Swap has to do with a free blow-out, but it has something to do with trying their products and turning your hair into your biggest accessory. Whatever, it's free! It's also to celebrate the launch of the Fekkai Silky Straight Ironless collection. Plus, if you buy two Fekkai products, you'll receive a free Brilliant Glossing Cream. To sign up up, call an ULTA store near you. The event takes place on Wednesday, April 14 from 5 to 8pm, and Thursday, April 15 from 10am to 3pm. Choose between "Silky Straight" or "Full Blown Volume" and make sure to have plans that night! Since you're already making the trip, here's a coupon to use while you're there. Save $3.50 off a $10 purchase at ULTA, valid April 11-17. Every week, there's something to look forward to. Friday. This week there's something extra special to look forward to. Fryday! Jack in the Box has a new fry and they want you to try it. Just show up at a Jack in the Box near you on Friday, April 16 for a free small fry. The offer is limited to one per person and no coupon is necessary. For more information, visit www.jackinthebox.com. Free bagels are back at Einstein Brothers and Noah's Bagels! Receive a coupon for a free bagel on Fridays until 11am, valid through May 22, just for being a Facebook fan. You'll also get a coupon for $2 Tuesdays, which includes a bagel, schmear and coffee before 11am, valid through May 19. For Einstein Brothers, visit the offer on Facebook, then click "Become A Fan." From there, allow the offer to access your profile, and a coupon will appear. Or, you could just print this coupon. To find an Einstein Brother's near you, use the Store Locator, which does include Noah's Bagels locations. For Noah's Bagels, print the coupon at www.noahs.com/offers. There's no need to be a Facebook fan of Noah's, but you'll receive updates of more offers like this if you are! Note: This free bagel does NOT include schmear, which will cost ya. There's a massive knot in my left shoulder. The knot is so bad, it even intimidated the chair masseuse who frequents the office occasionally. It's time for the read deal. It also happens to be time for another Spa Week, taking place next Monday, April 12 through Sunday, April 18. What's so special about Spa Week? $50 treatments galore. From facials and pedicures to body-wraps and massages, the locations participating in the event have some sort of special for you. The catch? The amount of cities in each state that participate are limited. In California? Look for locations in the San Francisco Bay Area, Los Angeles, Orange County, and San Diego. If you're looking for the full-day spa experience, book your treatment at one of the hotel spas and try to stay away from the malls. To find a spa or salon participating in Spa Week, and see what $50 treatments are offered, visit www.spaweek.com. With the arrival of spring, comes the arrival of wedding invitations. Yes, bridal season is on its way. If the happy couple is registered at Macy's, here's an offer you can't refuse. Receive $20 off your Macy's registry purchase of $100 or more, in stores or online, through April 15. Search for the couple's registry at Macys.com and enter code REGISTRY at checkout. Prefer to shop in person? Print your coupon for in-store use. The discount applies to sale and clearance items, but the promo code cannot be combined with other codes. In typical Macy's style, the offer has a laundry list of exclusions, including All-Clad, Le Creuset, Tumi, Wüsthof, area rugs, electrics and electronics, furniture, mattresses. Irritating, yes, but we'll take what we can get, right? Unless you're like me and you've never spent more than fifty bucks on a wedding gift! The mailman delivered a free tube of mascara recently and I was baffled. Fortunately, Google was there to help. The free tube of Bodyography Waterproof Mineral Mascara was from Allure! Duh. Allure magazine has some of the best, most winnable freebies around, I should have known. While there, enter to win $765 of Perricone MD products anytime this month, including Advanced Face Firming Activator, Cold Plasma, Citrus Facial Wash, Face Finishing Moisturizer, Skin & Total Body supplements, Hydrating Nutrient Mask, High Potency Eye Lift, High Potency Amine Complex Face Lift. Your skin will be happy if you win.